President Moon Jae-in's use of a different word, instead of a "groundbreaking ceremony," to refer to the beginning of an inter-Korean road and railway reconnection project, appears to reflect his cautious approach in making sure the project doesn't violate sanctions, observers said Monday. In September's third summit with North Korean leader Kim Jong-un, Moon agreed to hold a groundbreaking ceremony before the end of the year for a reconciliation project to reconnect two sets of inter-Korean roads and railways. Speaking to reporters on Air Force One on his way to New Zealand from Argentina, however, Moon referred to the envisioned event as a "launch ceremony," instead of a groundbreaking one, in an apparent indication that the beginning of actual construction for the project could violate sanctions. "If we do the work of actually reconnecting (the roads and railways), it could infringe upon international sanctions," Moon told reporters. "It is a matter that requires additional consultations with the United States and the United Nations." 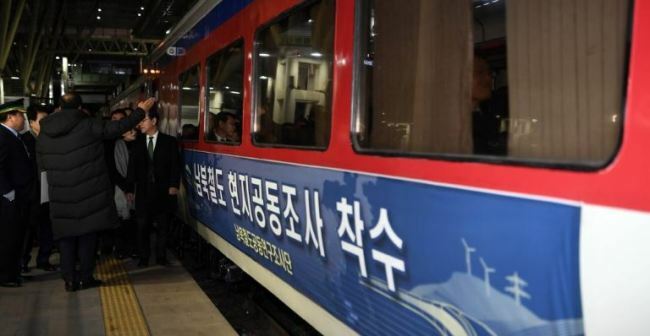 Still, Moon said he believes the Koreas could hold a launch ceremony, not breaking ground on the project, but "that too will be fully discussed with the US"
The Koreas began a joint inspection of North Korean railways last week after months of delays amid US concerns about possible sanctions violations. The joint inspection came only after the US expressed support and the U.N. Security Council granted a sanctions exemption. Moon effectively ruled out the possibility of him and the North's leader attending the launch or groundbreaking ceremony, suggesting that the event will be held in a low key manner. Moon said Kim's reciprocal visit to the South should take place first. The North's leader agreed earlier to visit the South Korean capital before the year's end to reciprocate Moon's trip to Pyongyang in September.